This Blog is a way to share my interest in all things food and drink related and a place to share my ideas along with some of my own favourite recipes. I hope you enjoy reading it. I am always keen to learn more so feel free to get involved, and you are very welcome to share and comment on the posts. Here's my recipe for Pulled pork. It is a real crowd-pleaser and is great to serve when entertaining or for a big family meal. A few years ago I was planning what to cook for Christmas dinner and wanted to add a second meat choice (I was obviously feeling a bit nervous about my Turkey). I opted for Gammon but had to cook it separately as there was not enough room in the oven. 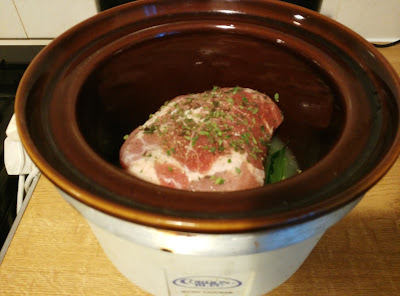 I discovered you can cook it in the Slow cooker and now I don't cook it any other way. It couldn't be easier and the results are fabulous. You can just switch it on and pretty much forget about it while you prepare everything else. There's no complicated method, no need for brining or basting and no chance of it overcooking or going dry so it's perfect for when you're entertaining. There are loads of different variations you can try, using all manner of herbs and spices, but the basics remain the same. The Gammon is cooked slowly for a long time in a small amount of sweet liquid to offset the saltiness. Here's my super simple recipe. When the weather is getting colder you can't best a good hearty stew, and for me serving it without dumplings would be unthinkable. Here's my recipe for how to make a Vegetarian version without using Suet. Here's my recipe for a delicious hearty Leek and Potato Soup. Some people add milk but I don't think it's necessary, the potatoes go almost creamy once they are blended. The butter could easily be omitted to make this a Vegan dish. Who doesn't love carving a Pumpkin at Halloween? It's great fun and you can get the kids involved. I use a Mellon baller or Ice cream scoop to scrape out all the flesh from the inside, but it seems really wasteful just to throw it all away! Inspired by this reluctance to waste food here's my recipe for a simple Thai spiced Pumpkin soup.